for Sage 300 Construction and Real Estate (formerly Sage Timberline Office), Sage Estimating, and Sage 100 Contractor (formerly Sage Masterbuilder). If you are using Service Management in Sage 300 Construction and Real Estate or Sage 100 Contractor, then you know that you have all the pieces you need to run the back office for a service organization. But to get the most out of your investment with Sage Software, your technicians need an easy way to interact with it. Your field staff is mobile. They are in their service trucks or on your customer’s sites most of their day. Using a laptop, they could use remote desktop to interact with Service Management directly. But there are some major problems with this. One, Service Management assumes the user has full permissions and knows and understands exactly what they are doing. For this reason alone, most service companies do not want their technicians to monkey around directly in Service Management. They might upset the delicate balance or order that your dispatchers work so hard to maintain. Two, using Service Management in the field would require a laptop. Although this was a solid option a few years ago, the advent of the tablet has rendered the laptop obsolete for field technicians. Tablets are much less expensive, have a longer battery life, a built-in Internet connection, turn on and off instantly, and don’t require a flat surface to work on. So if you aren’t going to let your technicians remote into Service Management, you need software that is designed for your technicians to use out in the field. Of course it would be web-based. The web allows your technicians to access the software anywhere on any device that browses the web. As long as the software talks to Service Management, you are good…right? What’s all this talk about cloud software then? Cloud software means that all or at least most of the software package you are using is hosted by professional data centers in the cloud. Translation: You do not have to install the software on your servers, or worry about hosting the website at all. Why would this be an advantage to you? Because it means you don’t have to buy or maintain a web server and you can rest easy at night knowing if something goes wrong, your cloud service provider is responsible to fix it, not you. So what is “the invisible cloud”? Cloud-based software is traditionally web-based, but it doesn’t have to be. In reality, the most optimal software solution for mobile work flows, is the software that adapts to maximize the potential on whatever device you are using. If the software abstracts its cloud based nature, so that as far as the user is concerned, it looks, performs, and has features like it is local to their device, then the cloud has been made INVISIBLE. hh2 Field Service is such a system. The core software is in the cloud (on our servers), we install a synchronization tool on your Sage 300 Construction and Real Estate or Sage 100 Contractor server and it keeps the cloud service up to date. Like traditional cloud software, we have an awesome web interface. It allows your techs to use the software from any device they wish and changes from the cloud are updated in Service Management, in seconds. But we have taken it several steps further. 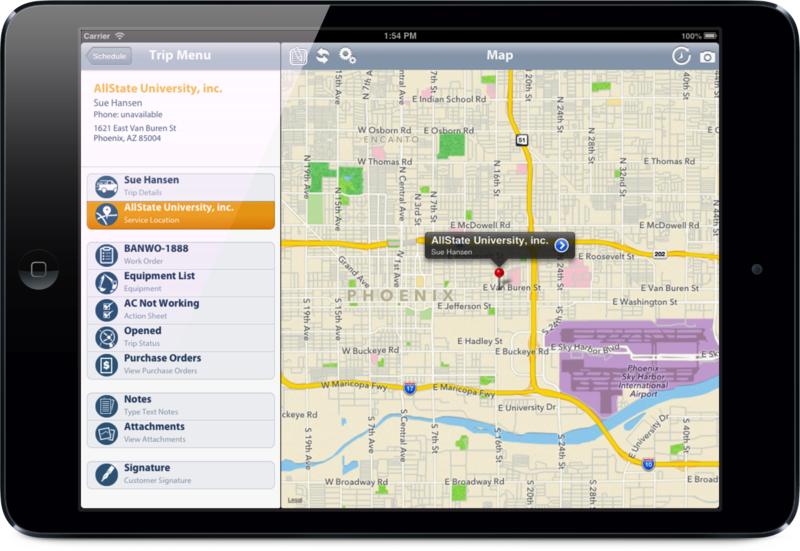 Instead of just providing a web interface, we have ALSO provided an exceptional experience using native iPad apps. When you are using the app, synchronization with the cloud is done automatically in the background. Using push notifications, the iPads are notified of new work orders or changes within seconds, and updates on the iPads bounce through the cloud to update Service Management on the fly. If the device goes offline, it queues up the updates, and sends them when the connection is restored. Why go with a service that renders the cloud invisible? Because you don’t have to worry about the connection or any of the technical details…it just works. There is better news still. hh2 Field Service has a customer portal coming out this fall, that is a free add-on for all customers. And if you add up our up-front costs and service fees, you will find that we are a tiny fraction of competitors that not only make you host your own software, but lack the device specific capabilities that permeate the hh2 Field Service experience. If you haven’t seen a demonstration of our software, we invite you to schedule one today. See for yourself the benefits of having your technicians and your dispatchers communicating and cooperating smoother than ever before. Contact us at 1-877-442-9327 or email us at sales@hh2.com to schedule your personalized demonstration today. I agree with your thoughts mat, Construction industries changing its face with time it needed more creativity and uniqueness. Although as a Construction Project manager, I work is to manage only but instead I know how hard architect work on this. I just want to say thanks to technology which blessed me with Cloud based Construction Management Software, which help me a lot to reduce risk. This is one office which is important and also vital for this organization. There are certain construction companies which offer extraordinary services. Flooring is the first thing that is usually noticed while entering into a building. Whosoever enters into building notices its flooring. Floors are the only thing in the interiors that cover a large space. There are various materials provided in the field of construction to make floors look amazing, You can Check here Raised Access Flooring they provide Best Floors..
We studied your blog and it is very nice. We found it really interesting and meaningful. We like your blog and would like to visit it again. We generally create Project Management Software to make a plan of constructing and designing projects. Visit our page for more information. We studied your blog. We found it interesting. We generally works with Project Management Software to make a plan of constructing and designing projects. Visit our page for more information. With the growth of new industry and the continued focus on heavy industry, construction has a vital role to play here as well. For those Growth from claiming new industry and the begun and Johnson had proceeded concentrate on overwhelming industry, development need An basic part should assume here also. Lodging is Additionally on the climb. For 2012, those midwest saw a 24. 7% support On home-building, a business secondary since 2008. The big construction firms are therefore struggling due to big projects being put on hold or canceled which costing millions of pounds each is a big loss you chose best Construction site for your Big projects construction companies in armenia help you. Super article, It is worthwhile reading this article. I was searching such kind of article for a long time but now I think I got a article of my interest. I am thankful for these all suggestions about Cloud Phone Systems mentioned under this blog. One Of the best and informative blog you explained very well about the service management which is very useful we also provide Visakhapatnam Real Estate Services in india. really thanks for sharing such an nice article. Awesome article.The information I have been searching precisely. It helped me a lot,Keep coming with more such informative article. Would love to follow them. So which weight-loss the most slim quick keto effective? Millions of adults in the U. s. Declares are afflicted by this condition; and one the way to reduce it is to modify your diet. Foods rich in nourishment, such as potassium and calcium, as well as necessary protein and linens should be involved. you may have upped your calories without even realizing it. Try to spread meals out thinner, getting four to six smaller daily meals instead of two to three big ones. • Another objective you may not be dropping bodyweightfill fulfilled; rather finish the meals while you are still feeling hungry to some extent. In this case, you can have ignored your Keto hack everyday exercising regimen. It's far crucial to note that hoodia isn't a miracle ingredient. Sensible and healthy practices and lifestyle must be maintained while you're the use of hoodia. © 2012 Construction Software Alliance. Powered by Blogger.